Feeling dizzy or lightheaded? You�re probably dehydrated! According to some experts on the subject, however, the fact that you�re thirsty may mean you are already experiencing signs of dehydration. For as long as I can remember, it�s been suggested that we should drink at least 8 glasses of water per day. Regardless of how much water we consume in a day, one thing is for sure � water is essential. People have been known to survive without food for several weeks, but we humans can only live without water a matter of days. Although our bodies are 2/3 water, we lose much of this important element through perspiration, especially during the summer months when we spend additional time outside playing. Water is by far the best way to stay hydrated and ready to play that second game of volleyball. 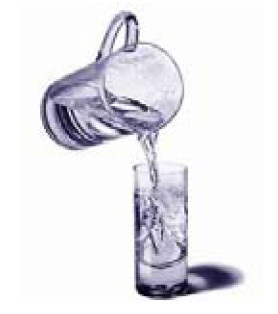 Ever notice that when you have �cotton mouth� or you�re feeling parched, your body craves water? Nothing quenches thirst better. It�s refreshing and, get this, it has no calories. Sports drinks do have their place. If you are exerting a lot of energy, energy drinks replenish salt and electrolytes while adding a boost of glucose. This means, of course, they are packed with sugar. They have place but they don�t replace good ol� water! One of the ways that I make sure that the people I care about are getting the water intake they need on a hot summer�s day is to always have a jug of ice water outside on the picnic table. At home, it sure cuts down on the trips in and out of the kitchen. When we are away from home, it�s easier that trying to remember whose bottle of water belongs to whom. Whether you prefer water straight from the faucet, bottled from a spring or purified, drinking plenty of water, particularly during the summer months, is a smart thing to do.